Following the Battle of Lexington in 1775, Mitchell joined General John Dagsworthy’s Battalion of Delaware militia. He was commissioned as adjutant until the age of 22. In 1776, Mitchell joined the General Washington’s “flying camp” under Colonel Samuel Patterson as a captain. In the summer of that year, Mitchell captured a detachment larger than his own company of British and Hessians near Perth Amboy, New Jersey. Captain Mitchell led his company to Philadelphia in 1777 and transferred to Colonel William Grayson’s Virginia regiment there. He recruited his own company of Delaware troops and spent the winter with General Washington at Valley Forge, Pennsylvania. On September 11, 1777, Captain Mitchell won the respect of his troops during the Battle of Brandywine when he insisted that no wounded man be left behind during the American retreat. He was disabled with “camp fever,” and did not take part in the Battle of Germantown on October 12, 1777. From December 1777 through February 1778 he was on furlough. Captain Mitchell won a hero’s laurels during the Battle of Monmouth in June 1778 when he was commander of Grayson’s Regiment under Grayson’s promotion to brigadier general. Captain Mitchell led an American attack upon the British when he was progressing well when its advance was halted by the command of General Charles Lee. This order so infuriated General Washington that Lee was court-martialed and cashiered out of the Army. Captain Mitchell was promoted to major in December 1778. In Colonel Nathaniel Gist’s regiment under General Peter Muhlenberg, Major Mitchell was active in defending the Norfork, Virginia, area against the British. After many successes, he was captured by the British when asleep in his tent after an unannounced retreat by the militia guards. He was paroled after the Battle of Yorktown in 1781. In 1797, he was given the rank of Brigadier General in the Delaware militia. After his return to Laurel, he married Hannah Morris, and the couple had six children. Mitchell was a member of the Congressional Congress 1786 – 1788, a federalist elector in 1800, and prothonotary of Sussex County 1788 – 1805. He was elected governor for the term 1805 – 1808, to the state House of Representatives in 1808, and the state Senate from 1810 to 1812. ABOUT 1800 HE BUILT A GRIST MILL AT THE DAM AT LAUREL LAKE AND OCCUPIED HIS HOME ON DELAWARE AVE., LAUREL, THE HOME IS STILL STANDING AND KNOWN AS “ROSEMONT.” HE WAS ACTIVE IN THE PARISH OF OLD CHRIST CHURCH AND OCCUPIED PEW NUMBER 38. MITCHELL DIED FEBRUARY 21, 1814, AND WAS BURIED IN THE CHURCHYARD NEXT TO THE CHURCH. 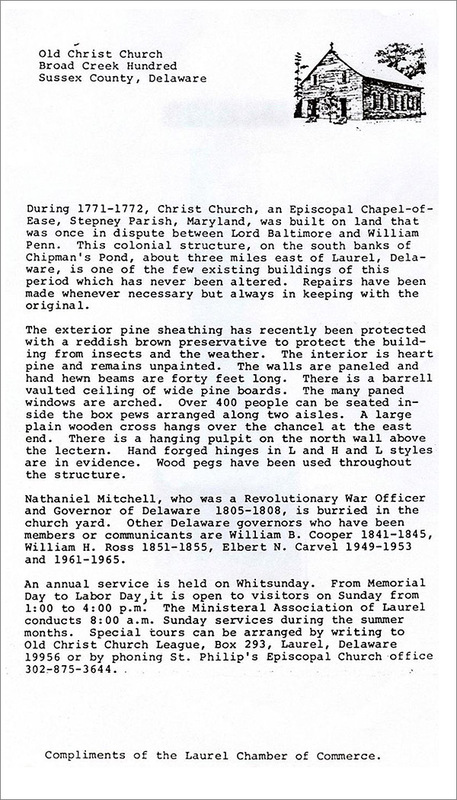 ON JULY 4, 1976, WITH APPROPRIATE CEREMONY, THE NATHANIEL MITCHELL CHAPTER THE DAUGHTERS OF AMERICAN REVOLUTION, THE LAUREL HISTORICAL SOCIETY, AND THE AMERICAN LEGION POST # 19, DEDICATED OF MARKERS TO HIS GRAVE SITE. By George D Graves, Junior, compliments of the Laurel historical Society.